One of the best things you can do for your overall health is to keep moving. In other words—walk. It’s what our bodies were designed to do. People who experience leg pain, however, often stop moving which can lead to many serious health problems. Ironically, the most common reason for feeling achy after walking is simply the fact that you need to walk more. 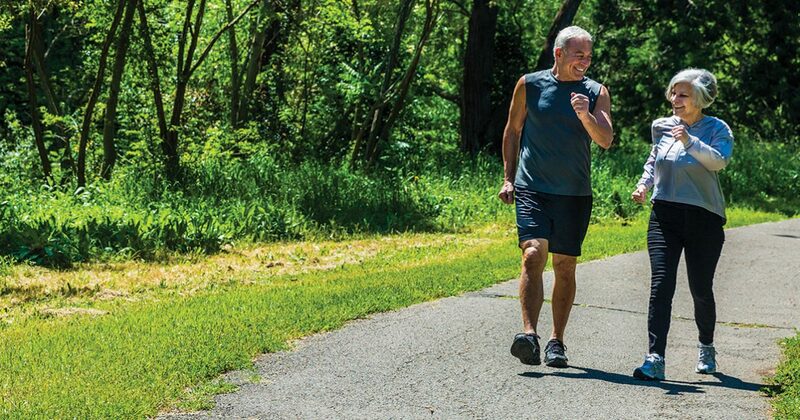 Walking frequently is important as we age because we decondition very quickly. Unlike in our youth, if we don’t exercise every few days, it’s like starting over. We decondition that quickly. If you aren’t getting a minimum of 5,000 steps a day (10,000 if you are younger and healthier), don’t start all at once. Start slowly, say 2,000 steps a day, then add 100 steps each day. This will help prevent achiness and encourage you to keep going. And to keep track of your steps, you don’t need an expensive, hi-tech device. A simple $10 pedometer will do the trick. In fact, before using a pedometer, I was convinced I was walking a lot more than I was, darting back and forth all day between exam rooms. But it turned out that I was sitting much more than I thought. Now, if I don’t hit my goal before bed, I take a quick walk around the neighborhood until I do. If you can’t walk because of pain, consider joining a facility with a swimming pool and walking in the water. You can enjoy many of the same health benefits without putting as much stress on your joints. Dr. Sonja Stiller is a diplomat of both the American Board of Emergency Medicine and the American Board of Venous and Lymphatic Medicine and is the founder of the Center for Advanced Vein Care located at 7200 Mentor Avenue, in Mentor. For an appointment, call 440-295-9105. More information can be found at YourHealthyVeins.com.